President Eisenhower invited Soviet Premier Nikita Khrushchev to Camp David in 1959 to discuss issues related to the Cold War. Upon receiving the invitation, Khrushchev was suspicious and wanted to know what sort of camp it was. In his memoirs, he recalled wondering at the time if Camp David was "a place they put people they don't trust, where they put people in some sort of quarantine where the President would travel alone to meet with me." Soviet Foreign Minister Gromyko and U.S. Secretary of State Christian Herter. When Khrushchev told Eisenhower that he used to watch Westerns with Stalin, Eisenhower chose one from the list below to watch on their first night at Camp David. At breakfast the next morning in Aspen, the Russian leader shared stories about his experiences in World War II. Vice President Richard Nixon joined them later along with other officials in a discussion about Berlin. 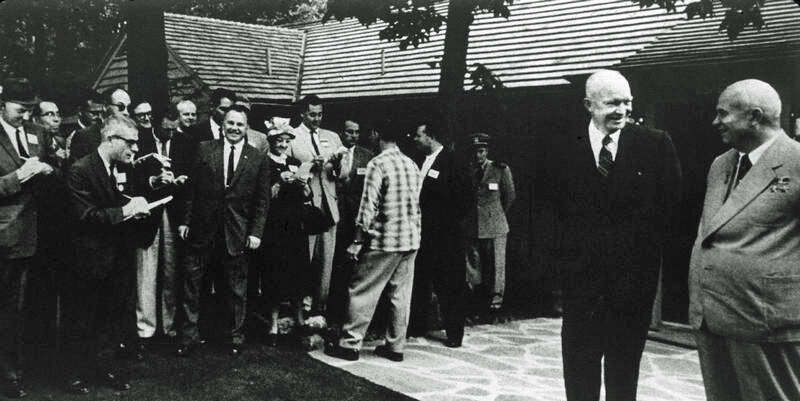 When it became clear that no progress was being made, Eisenhower and Khrushchev went for a long walk around the retreat and stopped off at Hickory Lodge to continue the discussion. The Soviet leader, who had never seen a bowling alley before, was impressed with the automatic pinsetter. The two leaders flew to Gettysburg in the afternoon for a tour of Eisenhower's farm. The leaders ate most of their meals in the Aspen Lodge. Below is the menu from Saturday night. After meeting for two days, Eisenhower and Khrushchev released a joint statement saying their discussions were useful and contributed to a better understanding between the two countries. In the months following his visit, Khrushchev would occasionally refer to the "Spirit of Camp David". When Eisenhower was asked about what that meant, he replied: "I must say I have never used it" and that it "must mean simply that it looks like we can talk together without being mutually abusive." 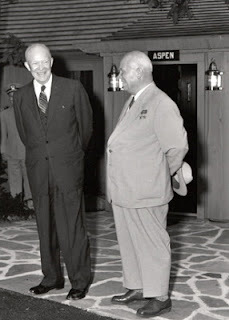 "THE CHAIRMAN of the Council of Ministers of the USSR, N. S. Khrushchev, and President Eisenhower have had a frank exchange of opinions at Camp David. In some of these conversations United States Secretary of State Herter and Soviet Foreign Minister Gromyko, as well as other officials from both countries, participated. Related blog post: Read about the preparations that were made in advance of the Khrushchev visit to conceal the construction area of the then-recently built underground command center at Camp David.